↑ "Management Team". goBackTV web site. Retrieved March 29, 2011. ↑ Baran, Paul (November 9, 1994). "Keynote Talk Transcript, 8th Annual Conference on Next Generation Networks Washington, DC". EFF "GII - NII - Wireless/Cellular/Radio" Archive. San Francisco, CA: Electronic Frontier Foundation. Retrieved March 29, 2011. 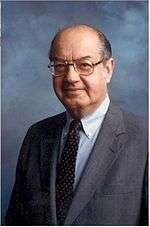 ↑ "In Memoriam: Paul Baran MS '59". UCLA Engineering web site. Retrieved March 28, 2011. Ryan, Patrick S. (June 1, 2005). "SSRN-Wireless Communications and Computing at a Crossroads: New Paradigms and Their Impact on Theories Governing the Public's Right to Spectrum Access" (PDF). Journal on Telecommunications & High Technology Law. Boulder, CO: University of Colorado, Boulder. School of Law; Silicon Flatirons Telecommunications Program. 3 (2): 239–274. ISSN 1543-8899. OCLC 66137086. Retrieved March 31, 2011. External link in |publisher= (help) This describes Paul Baran's development of packet switching and its application to wireless computing.